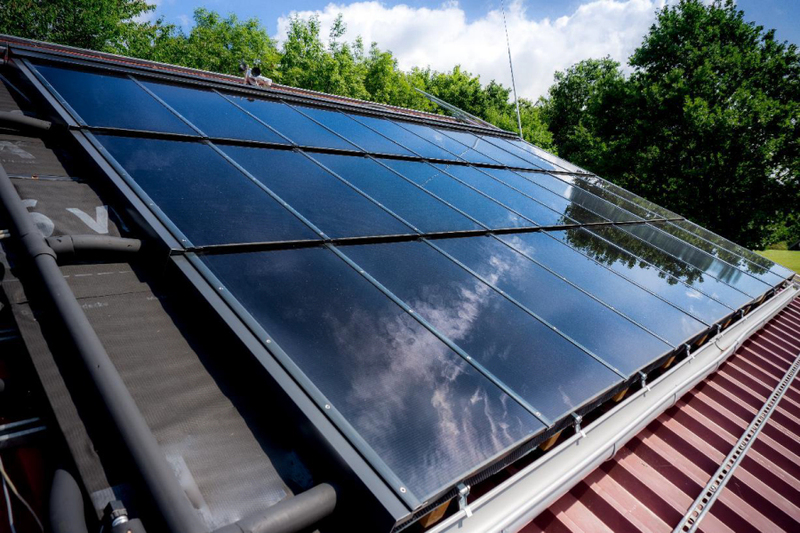 A rising number of manufacturers and suppliers in Europe are offering combined photovoltaic and solar thermal systems, also known as PVT units. This was one of the main messages of the International Workshop on the Status of PVT Systems, organised by Fraunhofer ISE on 16 May 2018 in Freiburg. The event, held as part of IEA SHC Task 60, Application of PVT Collectors and New Solutions in HVAC Systems, featured 15 speakers, who updated 63 attendees working in industry and science on the progress made with PVT products and research. The speakers demonstrated that there is demand for PVT systems and named several start-ups and specialist manufacturers offering products for a wide variety of residential, commercial and industrial applications. 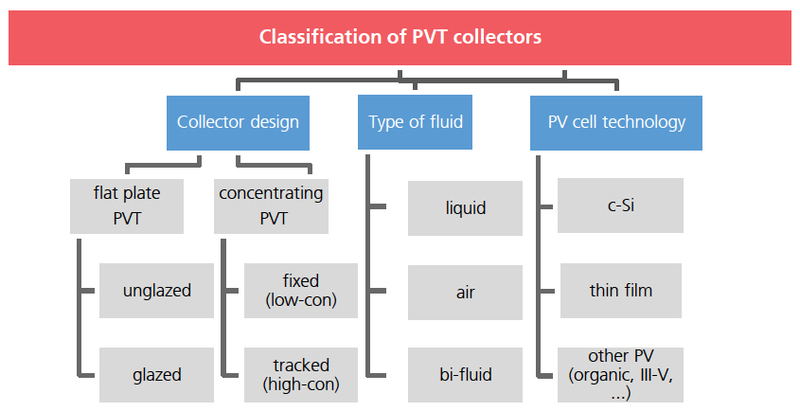 Most PVT collectors are unglazed (without a transparent cover) and used in combination with heat pumps, although there are some glazed ones and even more than a few examples of concentrating systems. Collectors can be put into three main categories based on the temperature range of the heat they produce: low (0 to 50 °C), medium (30 to 80 °C) and high (up to 180 °C). There has been a steady rise in the number of manufacturers offering PVT solutions. Corry de Keizer, Project Leader at the Dutch-based Solar Energy Application Centre, reported that 54 PVT products were available for sale in Europe, and another six were being commercialised. “Such an astonishing figure proves that innovation is on its way in the PVT community. But, at the same time, some volatility remains, as the PVT market is still at an early stage,” said Jean-Christophe Hadorn, Head of Task 60. The PVT Benchmark report that the Dutch organisation published in March contains not only a list of suppliers, including photos of their products and links to their websites, but also 32 companies which have already stopped offering PVT solutions. De Keizer said that, since the 1990s, researchers had carried out several PVT projects in the Netherlands, but they all had resulted in very little commercial success. The renewed interest in PVT has been mainly linked to the high demand for net zero buildings and the bad reputation that gas has had since the news broke about an earthquake at a natural gas extraction site in the north of the country in August 2012. The average PVT price stated in de Keizer´s presentation is 300 EUR/m2, about 10 % less than if one were to buy separate units of thermal collectors for 220 EUR/m2 and PV panels for 120 EUR/m2. De Keizer also listed the main technical barriers to wider PVT adoption, namely complex system design and installation, difficult optimisation and low reliability in the long term. Additionally, there are no standards to support the industry and convince customers and installers of the technology’s benefits. During his presentation, Manuel Lämmle, who works at Fraunhofer ISE, focused on the main research objectives when designing new and enhanced PVT systems. The first objective, he said, was to boost the performance of glazed PVT collectors by means of low-emissivity coatings. It had been demonstrated that heat losses by radiation could be reduced by 80 %, which would increase thermal efficiency. However, there were some drawbacks in the form of lower electrical efficiency, which would drop by around 3 %, and a higher chance of overheating collectors. 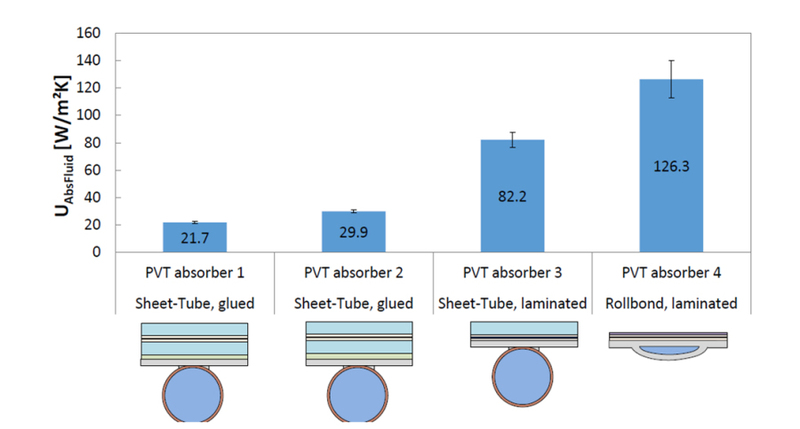 The second aim was to improve the heat transfer inside PVT absorbers to decrease the PV cell’s operating temperature and increase conversion and thermal efficiency. Laminating PV cells to metal sheets, without additional adhesive or insulating layers of air, could raise the heat transfer coefficient to between 80 and 126 W/m2K, while using glue for absorbers would yield between 20 and 30 W/m2K (see the chart below). This article was written by Riccardo Battisti, a solar thermal consultant and market researcher working at Ambiente Italia (Rome, Italy).